The Enterprise Social Intranet and Team Collaboration Software market grew by 40% in 2011 with total sales of $767.4 million. This represents a 100% increase since 2009 with an expected continual growth projected to exceed $4.5 Billion by 2016. The best enterprise social intranet software vendors are seeing their revenues double year after year. So who are the leaders in this industry? Who has a whopping 44% majority of the market share, leading the best enterprise social software vendors? Well, it might not be who you expect. IBM only has a 14% market share, Jive can only claim 8% and Yammer has less than n 3%. 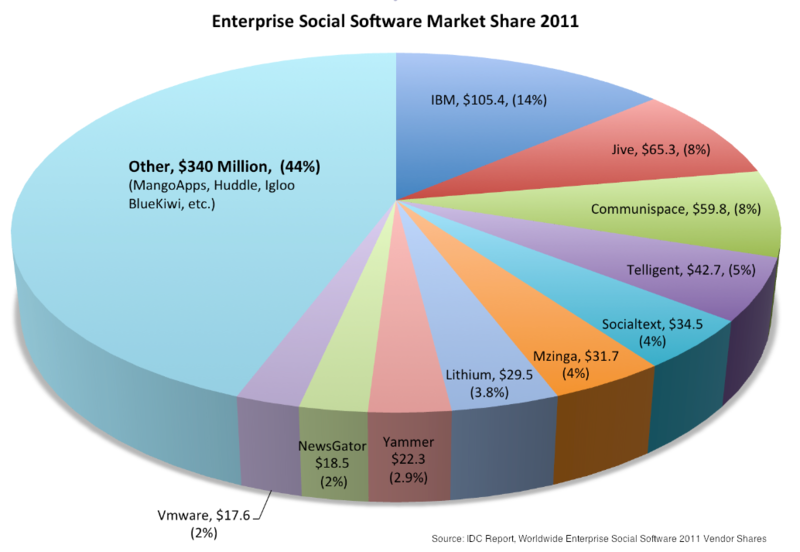 Surprisingly enough the top enterprise social software provider is actually the collective smaller aggressive start-ups. A combinaton of many small firms (MangoApps, Huddle, BlueKiwi and more) accounted for an incredible $340 million in revenue in 2011. How and why are the smaller intranet software vendors claiming the lion’s share of revenue? The answer is simple. Smaller firms cater to the small and mid-market space and these customers outnumber the Fortune 500 companies targeted by larger vendors. Small and mid-market companies are now requiring the enterprise-grade security, customization, and integration usually reserved for larger Fortune 500 accounts, creating huge opportunities for the start-up and smaller intranet software vendors. While the IBM and Jive’s of the world are happy to perform custom work for Fortune 500 accounts they expect small and mid-market customers to accept their solution as is out-of-the-box. Since significant value is gained by integrating existing business applications with the new enterprise social network, custom work is essential. Smaller enterprise social networks and intranet software vendors are often happy to customize a solution for small and mid-market customers, helping them to find the best solution basedon their specific needs. When Solera Networks, a big data security intelligence and analytics company in Utah wanted to implement a social collaboration network they looked at all possible intranet software vendors. Solera is a mid-sized company, yet they had specific “must have” needs that would require a vendor to customize their offerings. Solera demanded the higher security of a single-tenant private cloud deployment plus the customization to accomplish specific capabilities. Solera found that most vendors expected small and mid-size firms to accept their offering “as is.” Vendors that agreed to perform customization quoted the cost so high it was not economically feasible. 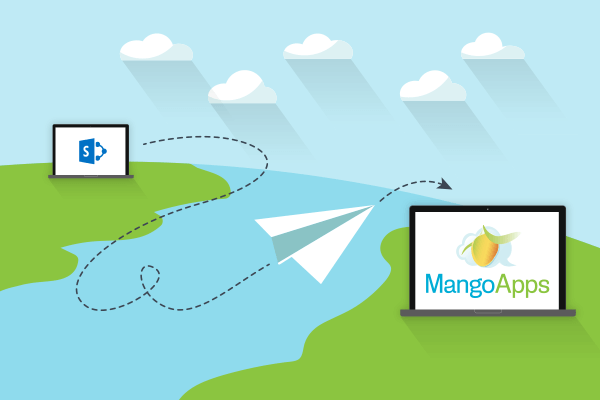 Then Solera found MangoApps intranet collaboration software, a “cool vendor” specializing in the small and mid-market space. Less than 30 days later Solera was up and running with a new enterprise social network that exactly matched their needs. Enterprise social networks are replacing email for communication, collaboration, and file sharing at work. Most will even allow you to invite in external “guests” so you can collaborate with partners, suppliers, and customers as well. What do you think? Will the best enterprise social software become the next business tool you can’t live without?